Researchers have demonstrated 3D printing of micron-scale optics with unprecedented performance and reproducibility. Their approach can be used to create almost any type of integrated optical element on a micron or smaller scale, which could help miniaturize instruments and devices used in applications from sensing to telecommunications. In The Optical Society's journal for high impact research, Optica, researchers report direct fabrication of optical elements as small as 4.4 microns onto the exact center of an optical fiber only 125 microns in diameter, just slightly thicker than the diameter of a human hair. 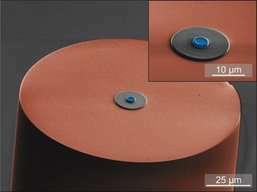 They used a technique known as femtosecond laser writing to accomplish this difficult feat and showed that the performance of the optical elements closely matched simulations. "Although femtosecond laser writing has been demonstrated in the lab, we have shown that it can be used to make high performance micro-optics in a manner that is highly repeatable and reliable," said Harald Giessen, chair for ultrafast nano-optics, University of Stuttgart, who led the research team. "We believe our approach can be scaled up for volume manufacturing and used to directly print almost any type of optical element on a tiny scale, opening up a new era of integrated micro- and nano-optics." Femtosecond laser writing uses a laser that emits very short pulses of light to selectively harden a light-sensitive material. The material hardens only in the small 3D area where the laser light is focused, and any unhardened material can then be washed away, revealing the 3D structure that has been created. Although many labs around the world have made their own 3D laser writing systems, these home-made systems are sensitive to environmental conditions and variances in laser power and thus can't reliably create high quality micro-optics. To overcome these problems, the researchers used a commercially available two-photon 3D laser lithography system designed to write nanometer-sized structures. The system, made by Nanoscribe GmbH, is engineered for stability, reliability and quality. "We have something like a pen that we can move in 3D through a material to create structures in a manner similar to a 3D printer but at very tiny scales," explained Giessen. "If you punch a set of parameters into our system and into a system in some other place in the world, you will get the same exact result. Even months from now, it will come out the same every time." The researchers used the 3D laser writing system to create optical elements known as phase masks, which offer an elegant way to shape the light coming out of the end of a fiber without using large, bulky lenses. Normally, light leaving the end of a fiber is Gaussian, meaning that it is bright in the middle and dims towards the edges. The researchers created phase masks directly on the end of the optical fiber that shaped the light into either a flat-top profile that is equally bright across the illuminated area or a donut-shape that features an empty middle surrounded by a bright ring of light. "Because the phase masks are so small and are created directly on the end of the optical fiber, even tiny errors in the centering of the phase mask would cause the donut-shaped beam to not look nice and round," said Giessen. "We solved one of the hardest problems: repeatedly placing a phase mask with submicron accuracy directly in the center of the single-mode fiber." The direct laser writing approach can be used to create optical elements in numerous ways. The researchers found that creating phase masks ring-by-ring beginning at the center or layer-by-layer starting from the bottom, both produced high quality structures. "Depending on how you write, you might have different optical properties, and also the velocity at which you can write and how fast you can manufacture an optical component depends strongly on your write mode," said Timo Gissibl, University of Stuttgart, the paper's first author. The phase masks created by the researchers have many potential applications. By replacing large optical lenses, the top-hat phase masks could enable illumination in much smaller endoscopes, which are used to see inside the body during non-invasive surgeries or procedures such as colonoscopies. An optical fiber with the phase mask that produces donut-shaped light could be placed directly in a liquid and used for optical trapping of particles or cells, for example. Also, photoacoustic endoscopy could benefit from the very compact hollow beam delivery, says Lihong Wang, the inventor of this technology. The research team is now conducting experiments to see if 3D laser writing can be used to create tiny phase masks that shape an optical fiber's output into twisted light, which is of great interest for photon entanglement and other applications. "Now that the instrument is available, we are only limited by what we can think of to do with it," said Giessen. My first thought when I saw the headline and byline is that this could be the future of camera lenses. New types of cameras are coming out that don't rely on the traditional lens arrangement. The world is moving to smaller and lighter lenses using novel ways of manipulating light, and microlenses are increasingly popular. Cameras in the future will make increasing use of microlenses, I believe.